Frog asked me to write about what I want for Christmas. What I want for Christmas is to kill titans. The titans must die. One of them killed my mother. I hate titans. I really want to kill them. I’ve been learning about this method to kill titans. One method is to slit the back of their necks while in midair. I think I will finally be able to kill the titan who ate my mother. I also think a great Christmas present would be the Armored Titan’s head, served on a giant platter. I wouldn’t eat it, of course. But I would like that present, because I hate titans and I also want to kill them. I must become strong, so that I can kill titans. Then the titans will die, which is good because I hate titans. That is all. Merry Christmas. Posted on December 16, 2013, in Posts Written By Anime Characters and tagged 12 days of anime, shingeki no kyojin. Bookmark the permalink. 6 Comments. damn it froggy. I love these guest writers you bring in. Eren is surprisingly not very angry today though, since he isn’t shouting and using caps. Must be because of Christmas. I noticed the same thing. HE MUST USE ALL CAPS DAMMIT!!!! I agree wit you, Levi would be a nice present. I would also not disapprove of this. ahah. those posts are great. 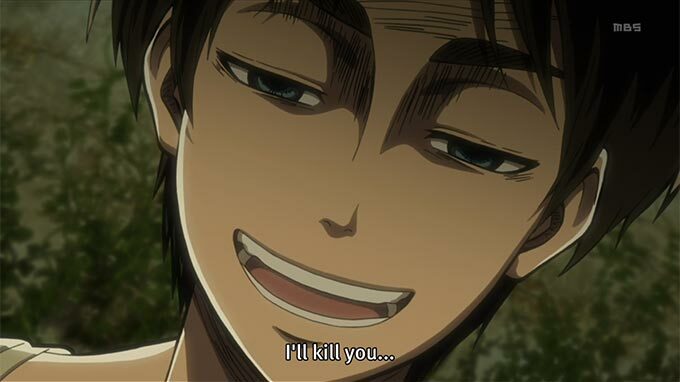 This is the calmest I’ve seen Eren talking about killing titans. Not a single exclamation mark in the post!